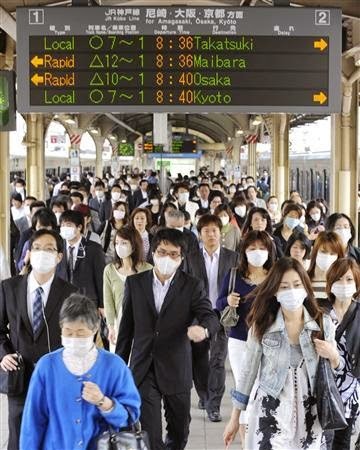 It's flu season in Japan. Apparently it's a little bit of a record year with over two million arriving at hospitals across the country for treatment so far. And although the infection rates are beginning to decline, it's been my turn this week. Back in 2009 I contracted Pig Flu, and this one is a walk in the park compared to that. I can type for a start, I couldn't even think that time. As I fell sideways, felled by a billion little viral axes, my son bought a copy of Kung Fu Panda, which he retitled "Kung Flu Panda", and sat with me for five days as we watched it over and over again while I recovered. Japan has first rate medical facilities and containment systems are fast and effective. In 2009, as Swine Flu swept Asia, Japan simply closed all the schools in the affected areas to maintain quarantine and although some cases did get through, life outside the Kansai region continued pretty much unaffected. The once popular anti-viral drug Tamiflu received bad press after the outbreak, being blamed, rightly or wrongly, for a number of bizarre deaths where people hallucinated believing they could fly. It didn't end well. And so the approach now is largely preventative. Everywhere you go you'll find bottles of hand-wash, especially around elevators and escalators where pressing the buttons or holding the rail is an excellent conduit for transmission. However the favourite form of protection to ward off the onslaught of flu is the ubiquitous face mask. Congratulations to the company that invested in developing these. Doesn't help when you already have it and are sitting typing a blog post though.